This recipe is an easy and faster way to enjoy a semi-healthy dessert without going through the whole apple pie preparation. I changed some things from the original version in the Pampered Chef cookbook to suit my tastes. I often make this with an olive oil crust or if pressed for time, I buy the Pillsbury Pie Crust already made from the store. Homemade pie crust is the best but this dessert does meet my expectations of the “quickie apple pie”. One of my cousins just loves this recipe and has asked me to make it for her when she was in college. Seems like she could not focus on her studies unless she had Apple Pie Squares. Enjoy! Spread the pie crust in a stoneware bar pan or a baking sheet that is at least 12″ x 15″. Stoneware is the best. The 2nd pie crust will be used to cover the apples. Peel slice and core the apples. In a large glass bowl, mix the sliced apples, cinnamon, flour, brown sugar, salt well. Wait for about 2 minutes the sugar will disolve from the juice of the apples. Lay the sliced apples on the pie crust single layer close together. Cover the apples with 2nd pie crust (might have to roll it out some to fit the pan). Brush pie crust with egg /water mixture. Cut slits in the pie crust for steam to escape and prevents nice messy surprises in your oven. Sprinkle sugar on top of crust. Bake at 350 degrees for 30-35 minutes or until pie crust is golden brown. 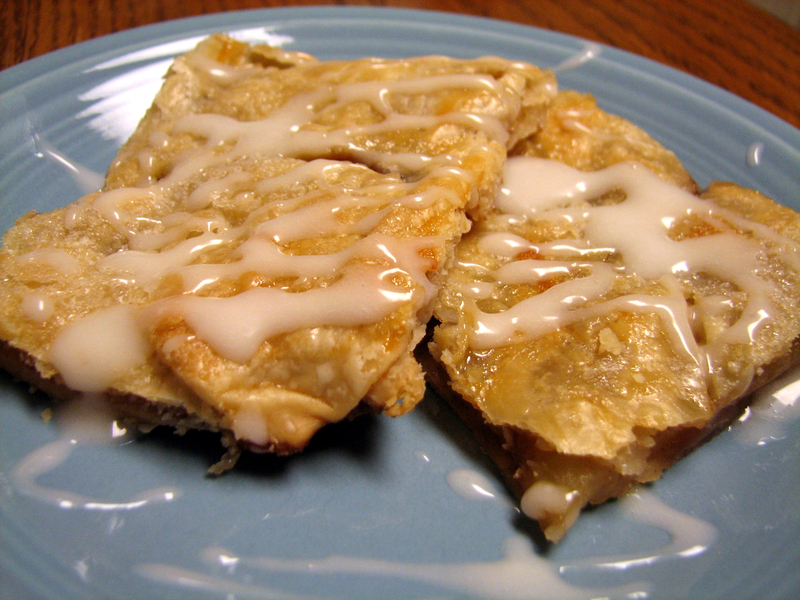 For Glaze: mix powdered sugar and milk together and drizzle over apple pie. Cut into 18 squares. I bet you don’t have any left! I made this recipe a lot for many of my Pampered Chef shows. This recipe was taken from one of the season’s best cookbooks that Pampered Chef sells. The warm apple-almond pastry is a light open-faced tart that brings a perfect sweet ending to a brunch or dinner. I made this today for a brunch and everyone loved it. Preheat oven to 400F. Grate ¾ cup of the almonds using Deluxe Cheese Grater. In Classic Batter Bowl, combine almonds, granulated sugar, flour, whole egg, egg yolk and almond extract; mix well and set aside. Unfold one pastry sheet onto lightly floured Large Round Stone. Roll to a 10-1/2” square using Baker’s Roller. (Corners of pastry will touch edge of baking stone). Prick pastry with pastry tool. 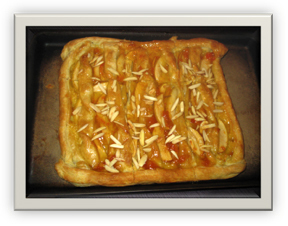 Spread almond mixture evenly over pastry to within 1” of edge. Cut apples lengthwise in half; remove stems and seeds using Cook’s Corer. Slice apple halves crosswise into ¼” thick slices using Utility Knife. Arrange slices in an overlapping pattern over almond mixture. Using Pizza Cutter cut remaining pastry into nine 1” strips. Moisten outer edges of dough with water. 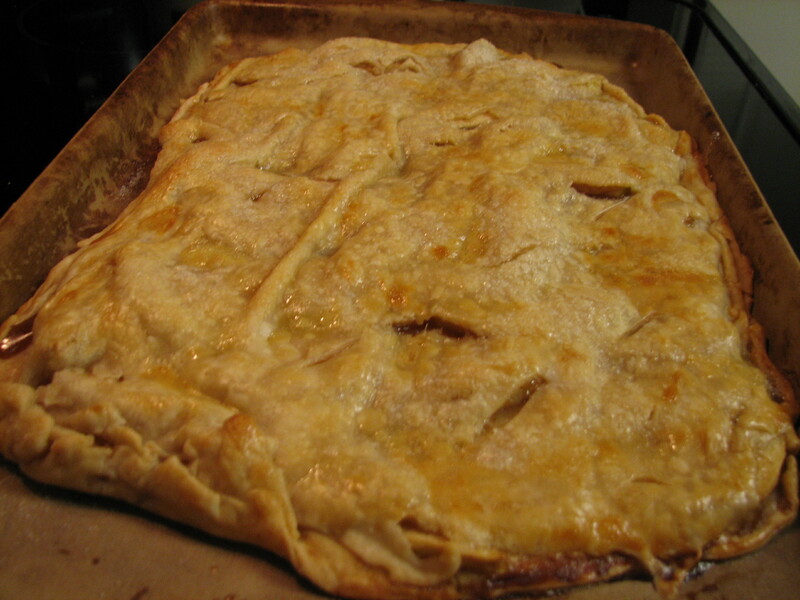 Arrange five of the strips diagonally over apples, twisting dough and pressing edges to seal; trim off extra dough. Arrange and press remaining four strips of dough around edge of pastry, forming an even border. Bake 30-35 minutes or until pastry is puffed and golden brown. Cool at least 10 minutes. Spread warm jam over apples and pastry. Place remaining almonds in Small Oval Baker; microwave on HIGH 5-7 minutes or until golden brown, stirring after each 30-second interval. Coarsely chop almonds using Food Chopper; sprinkle over pastry. Sprinkle with powdered sugar, if desired; cut pastry into squares. Serve warm with ice cream or whipped topping, if desired. This is the salad I usually make on New Year’s Day to go with my black eyed pea, turkey kielbasa and rice dish. I call this salad “Green Money a la Salad” as it works with the saying to eat green for money on New Year’s Day. The southern people I believe eat cooked collard greens, but since I am not fond of that I changed the tradition a little. I think the concept still fits, and I love it. Wash, core and chop apples into 1” bite size pieces and squeeze the juice of a ½ lemon over apples to prevent browning. Put baby spinach in a nice platter-like bowl. 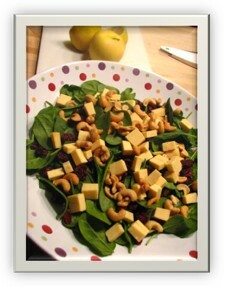 Sprinkle the chopped apples, cashews, cran-raisins and cheese on top of the baby spinach. Mix well, the flavor is really by individual taste, you can adjust the ingredients according to your taste and how much dressing you prefer over your salad. If you like a lot then you will need to add more ingredients. Enjoy!